Right before the end of the year, trader tax expert Robert Green will review trader tax status (business expenses), the tax treatment of different financial products including securities, futures, options and ETFs, critical tax elections, wash sale loss limitations, entities with retirement plan deductions, Obamacare taxes, and year-end tax planning. This entry was posted in Uncategorized and tagged Section 475, tax treatment, trader tax, wash sales on December 1, 2016 by Robert Green. It’s an inconvenient truth for brokers that the IRS asks them to report wash sale losses on 1099-Bs differently from the way traders must report wash sale adjustments on income tax returns. Brokers are correct in preparing 1099-Bs, but incorrect in telling clients they should import 1099-Bs into their income tax filings. [...] Click here. Thanks @twcarey for covering this tax story in Barron’s (1/23/16) “Two New Mobile Investing Apps for Millennials,” Divy introduces investing as a social exercise while Clink emphasizes regular savings. Plus, tax advice. Click here for excerpt. This entry was posted in Accounting and tagged accounting, wash sales on January 20, 2016 by Robert Green. We mailed the IRS Commissioner this cover letter and comments for the IRS Section 475 “Clean Up Project.” This blog post is comprised of those comments. Please take action: sign our Petition to Congress. Without your participation traders are too small a voice. The IRS recognizes problems with tax rules for active traders including Section 475 marked-to-market (MTM) reporting, Section 1091 wash sale loss rules and trader tax status (business treatment). These problems are connected. Only a trader who qualifies for trader tax status may elect and use Section 475(f) MTM ordinary gain or loss treatment. Otherwise with the default “realization method” (cash method), securities trades are subject to Section 1091 wash sale loss rules and capital gain and loss treatment. Wash sale rules are a huge problem for active securities traders; non-compliance is widespread and the IRS is not enforcing the rules. That is unsustainable. Traders, tax professionals, IRS and state tax agents don’t fully understand trader tax status (TTS), and the result is botched tax compliance causing significant losses from higher taxes, penalties, interest and professional fees. Hundreds of thousands of active traders qualify for TTS, trading their own funds as a business activity. Most of them don’t know they are entitled to file a timely election for Section 475(f) MTM ordinary gain or loss treatment and exemption from Section 1091 wash sale loss treatment. They also don’t realize they can use Section 162 business expense treatment as a sole proprietor or in a pass-through trading company without an election required for Section 162. Since enactment in 1997, Section 475 and TTS rules remain too confusing to tax professionals and traders. Many local tax preparers conflate the two code sections, not realizing a qualifying trader may use Section 162 but not elect Section 475(f). The IRS needs to do a better job with its guidance. There is no “statutory law” defining qualification for TTS. There is only “case law” and “trader tax” cases have a broad range of criteria without giving a bright-line test, except the Endicott court stated average holding period must be 31 days or less. Traders need similar standards for volume and frequency of trades and hours per day. Case law rewards losing day traders with TTS and 475(f) elections, but denies both to profitable options traders who may make a consistent living but have less volume and frequency of trades. The average trader with TTS has business expenses of approximately $15,000 and that does not stress the Treasury in terms of tax benefits. Section 475 was drafted for dealers in securities and or commodities. In 1997, Congress expanded Section 475 to include traders who qualify for trader tax status adding Section 475(f). The IRS added the terms “trader in securities” and “trader in commodities.” Traders must qualify for TTS to elect and use Section 475(f). Securities traders consider a Section 475(f) election for two reasons: exemption from wash sale loss deferral rules and the $3,000 capital loss limitation. Section 475 MTM is ordinary gain or loss treatment. Section 475 trading losses contribute to NOL carry backs and forwards which generate tax refunds faster than carrying forward capital loss carryovers, which otherwise are the biggest pitfall for traders. Section 475 MTM ordinary income is taxed at the same ordinary tax rate as short-term capital gains. The IRS needs to better define the term “commodities” in Section 475 (and throughout the tax code). The definition needs to clearly state that traders may elect Section 475(f) on “securities only” and retain lower 60/40 tax rates on Section 1256 contracts (futures and broad based indexes). While dealers sell bushels of wheat (commodities), traders do not. I appreciate the ABA’s comments to the IRS. Their comments on the definition of commodities are confusing. The ABA addresses dealers and traders, whereas we focus on traders only. One of the challenges in administrating Section 475 is in the determination of qualification for TTS. Falling short of TTS means the trader must suspend use of Section 475 and use the realization (cash) method until he or she re-qualifies in a subsequent tax year. Suspension treatment is not included in Section 475 rules, yet it should be. The concept is that without TTS, all open positions automatically become investment positions. Current rules for making a Section 475(f) election are too narrow and complex. In other words, there is a very small window of opportunity to consider and make a 475(f) election and most traders don’t speak with their tax advisor on time. Far too many qualified traders who would benefit from Section 475(f) miss the boat and that’s unfair. “Existing taxpayers” must elect Section 475(f) by the original due date of the prior year tax return (not including extensions). That provides about three months of hindsight from Jan. 1 until April 15 for individuals and partnerships and March 15 for S-Corps. It’s an election statement as there isn’t a tax form. The second step — to perfect the election — is to file a Form 3115 with the current year tax return. Many accountants think it’s a one-step procedure and they botch the election by missing either the election statement or the Form 3115 filing (required in duplicate). A taxpayer must attach the election statement to their extension or tax return and a certified return receipt only proves a tax filing not the election statement. The IRS admits they don’t have a system to record the 475(f) election, so they ask a taxpayer for a perjury statement on the Form 3115 representing they filed the election statement on time. The IRS provides relief for late Form 3115s but not late election statements. Tax law (Regulation Section 301.9100-3 relief) allows six months to file a private letter ruling to get late relief on certain elections including Section 475(f). But to date it has been almost impossible to get this type of relief for a late Section 475(f) election. The process requires a private letter ruling and the IRS denied all of them to date with the exception of Larry Vines who had a perfect fact pattern. The IRS refuses late relief for Section 475(f) by claiming prejudice to Treasury and hindsight. It takes almost a perfect set of factors to get by this stringent posture. An open portfolio of unrealized capital losses is currently considered enough of a reason for the IRS to deny late relief for a Section 475(f) election. Rather than loosen up here, I prefer the IRS just allow a Section 475(f) election with more time. Focusing too much on hindsight disenfranchises traders. Under current law, there is an exception for “new taxpayers” like a new entity. A new taxpayer may elect Section 475(f) by internal resolution within 75 days of inception. If you start trading after April 15, you can’t make a 475(f) election as an individual; but you can form a new entity to make the election within 75 days of inception. The new taxpayer exception isn’t clear or broad enough. The IRS should broaden it to accommodate “new traders” qualifying for TTS, not just a new entity. Individual traders or entities qualifying for TTS after April 15 should be able to elect Section 475(f) within 75 days of qualification. I think the IRS should go even further by allowing the election on the tax return filing after year-end. Traders using Section 162 business expense treatment simply claim that treatment on their tax return (Schedule C) where they also choose the cash method or accrual method of accounting for expenses. Why not enact the same procedure for a Section 475(f) election? Why make Section 475 confusing and different from Section 162 since they are so tied together already? Most tax professionals don’t know their client qualified for TTS until tax time and often that’s after the April 15 deadline for filing extensions. Their clients often miss the 475(f) election for the past year, as well as the current year, too. Taxpayers often don’t discuss election opportunities with their accountants until after year-end, not when they launch a new activity. Traders don’t even realize that trading can be a business; otherwise they might call their accountant early on. It’s unreasonable for the IRS to assume traders can digest the complications of Section 475(f) and TTS on their own. While extending the 475(f) election until tax filing time gives traders more hindsight during the first calendar year (and into the next tax year) and new IRS rules for revocation allow reversal in a subsequent year, once revoked, Section 475 can’t be re-elected for five years. Most tax elections are made on a tax return filing, and they are not required earlier in the year – hindsight is allowed. With so many traders missing the boat on Section 475 — and then building up a capital loss carryover hole committing them to the realization method — it’s reasonable for traders to conclude the onerous 475(f) election rules are intended to disenfranchise traders from using ordinary loss treatment. The original tax law on Section 475(f) mentioned the IRS would issue a tax form for the election. But, to date the IRS has not issued a form. Even with the S-Corp election Form 2553 due within 75 days of inception, the IRS grants relief for late-filed elections. I don’t see precedent for stringent hindsight rules against traders. Missing the Section 475(f) election requirement is the biggest problem in Section 475 and it causes the most inequity for traders contrary to the intention of Congress in expanding Section 475 to traders. I disagree with IRS proposed regulations for segregation of investments from Section 475 calling for a separate investment account. As tax preparers for traders, real world fact patterns can be confusing and it would be good if the IRS issued more guidance on segregation of investments. If a client trades the same symbol for which he invests and uses Section 475(f) for active trading but not investing, should all the symbols traded and invested be consolidated into Section 475(f) or into investment treatment, or otherwise? The proposed regulations offer some solutions but they need more work. Tax preparers need support for taking positions that don’t prejudice Treasury. In general, I agree with many of ABA’s comments on May 7, 2015 in this regard. A Section 475(f) election is an escape hatch for a qualifying trader from wash sale loss treatment (Section 1091). When the IRS considers changes to Section 475, they should also address significant problems with Section 1091 as these code sections are joined at the hip for active traders. IRS rules for broker 1099Bs differ from rules for taxpayer reporting of wash sale adjustments on Form 8949 (Capital Gains & Losses). The IRS requires brokers to calculate wash sales based on identical positions (same symbol) per account. Conversely, the IRS requires taxpayers to report wash sales based on substantially identical positions (stocks and options) across all accounts including IRAs. With apples and oranges structurally in the rules, there are obviously large, unreconciled differences between broker 1099Bs and taxpayer Form 8949, especially for active traders with multiple accounts and those who trade stocks and options. These 1099B matching problems will overwhelm the IRS in coming years. Too often taxpayers and tax professionals cut corners choosing to solely rely on broker-issued 1099Bs. They don’t comply with different IRS wash sale rules for taxpayers (see above). Brokers aren’t helping with taxpayer compliance; they are encouraging clients to download 1099-B data into TurboTax and they don’t sufficiently mention Section 1091 compliance issues. The IRS needs to either enforce or change the wash sale rules to better coordinate broker and taxpayer reporting. In 2008, Congress enacted cost-basis reporting to close the “tax gap” on investors. Prior to cost basis rules, Form 1099Bs only reported proceeds on securities, and cost-basis information wasn’t included. Starting in 2011, the IRS phased in the cost-basis reporting rules. While cost-basis reporting requires wash-sale adjustments, it falls short of the needs of active traders with multiple accounts and those who trade substantially identical positions (stocks and options). Starting in 2014, 1099Bs reported equity options for the first time. But brokers don’t calculate wash sales between stocks and options and options at different expiration dates whereas taxpayers must do so. This will generate many unreconciled differences or non-compliance with Section 1091 rules. While cost-basis rules help the IRS with millions of investors, they are not working well enough for active traders who are stuck with huge unreconciled differences. The choice is either reconciliation and non-compliance or huge differences and compliance. Cost basis problems are another great reason to open the door wider to 475 elections. It’s easier to explain why a Form 4797 (where 475 is reported) is different from a 1099B prepared for the realization method. A sole proprietor trader tax return is a red flag in the eyes of IRS agents and IRS computer algorithms because Section 162 trading expenses are reported on Schedule C but trading gains and losses are reported on other tax forms. That looks like a losing business without revenue. There should be a formal way to transfer some trading gains to Schedule C to show a profitable activity or zero it out. Trading gains are not self-employment income (SEI) and they are exempt from SE tax, with the exception of members of a futures exchange (Section 1402i). Traders work hard every day and they deserve a tax code that respects their unique tax needs. Since the Great Recession of 2008, the markets have experienced tremendous growth and capital gains taxes have skyrocketed. Darren Neuschwander CPA and co-managing member of Green NFH contributed to this blog post. This entry was posted in Section 475 MTM, Tax Compliance, Tax Treatment On Financial Products, Trader Tax and tagged Section 475, trader tax, wash sales on May 14, 2015 by Robert Green. Wash sale losses are a major source of confusion for taxpayers and brokers come tax time, so we answered several FAQs to help. What’s the best solution for reporting wash sale losses correctly? Trader tax accounting software that downloads all purchase and sale transaction history and calculates wash sale losses according to taxpayer rules recapped below. In most cases, taxpayers can’t solely rely on 1099Bs or broker profit and loss reports for reporting wash sales. GreenTraderTax recommends software to calculate wash sales across all your accounts and for generating a correct Form 8949. You need to reconcile Form 8949 to 1099Bs and explain the differences as best you can. 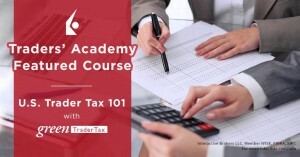 Click here to learn about GreenTraderTax’s accounting service for securities traders. What are wash sale losses? The IRS wash sale loss rules (Section 1091) are written to protect the U.S. Treasury against taxpayers taking “tax losses” at year-end to lower tax bills while they get right back into the same positions. The IRS views that as a tax loss but not an economic loss and much of the tax code prevents that from happening. Wash sale loss adjustments defer losses to the subsequent tax year, where a taxpayer hopefully can utilize that loss. However, if you trigger a wash sale loss with an IRA, you permanently lose the wash sale loss. Do I have to account for wash sale losses? Yes, if you trade securities including equities, equity options, ETFs, narrow-based indices (made up of nine or fewer securities), and bonds. Click here to learn more about securities. What’s exempt from wash sale losses? Wash sales do not apply to Section 1256 contracts including futures, broad-based indices, and options on futures since they are marked-to-market (MTM). That’s economic reporting and there’s no way to defer wash sale losses. Click here to learn more about Section 1256 contracts. Business traders with a Section 475 MTM election are exempt from wash sale loss reporting on their business trading positions. Consider a timely 2015 Section 475 election to convert 2014 wash sale loss deferrals on business positions into ordinary losses on Jan. 1, 2015. Click here to learn more about Section 475. Existing individuals and partnerships must file a Section 475 election by April 15 and S-Corps by March 15. Where do I report wash sale loss adjustments? Report wash sale loss adjustments on Form 8949 (instructions), along with other cost-basis reporting. Learn more about cost-basis reporting in the Green Trader Tax Center. Do brokers report wash sale loss adjustments on Form 1099B? Yes, but in compliance with IRS rules for brokers which differ from IRS rules for taxpayers. In most cases, taxpayers need to do additional work on wash sale loss reporting. How do broker and taxpayer rules differ on wash sales? Brokers calculate wash sales based on identical positions (an exact symbol only) per brokerage account. Section 1091 requires taxpayers to calculate wash sales based on substantially identical positions (between stocks and options and options at different exercise dates) across all their accounts including IRAs — even Roth IRAs. What is a substantially identical position? Apple stock and Apple options are substantially identical, but Apple stock and Google stock are not substantially identical. Are options subject to cost-basis reporting and wash sale loss adjustments? Yes, IRS cost-basis reporting rules phased-in options purchased on or after Jan. 1, 2014. Brokers won’t report a wash sale loss between a stock and an option, but taxpayers must do so. Options at different expiration dates have different symbols, so they are considered substantially identical. Can I rely on my 1099-B for reporting wash sale loss adjustments? Only if you have one brokerage account trading equities. If you trade stocks and stock options, or just stock options and/or have multiple brokerage accounts, you can’t rely on brokerage firm Form 1099-Bs for reporting wash sale losses correctly because there will be differences in application of taxpayer rules on substantially identical positions. Are brokerage firm profit and loss reports similar to 1099Bs? Yes, brokers use the same accounting for the 1099B and their profit and loss reports. When brokers suggest downloading a 1099B into TurboTax, they really mean downloading their profit and loss report. Those P&L reports account for wash sales based on broker rules, not taxpayer rules. Do I have to worry about my IRA accounts in my wash sale loss calculations? Yes, as recapped in IRS Pub. 550 above, Section 1091 includes all types of IRAs. It’s a catastrophic mistake to trigger a wash sale loss in your IRA since you will never get that tax loss benefit as it won’t reduce distributions in retirement for a traditional IRA. It’s wise to avoid trading substantially identical positions between an IRA and your taxable accounts. What accounts are included in the wash sale loss analysis? It goes by taxpayer identification number. If you are married filing joint, make sure to include each spouse’s separate, joint, and IRA accounts. Are entity accounts included in the wash sale loss analysis? Maybe. Although Section 1091 rules do not include your entity accounts, Section 267 related party rules can drag your entities into the wash sale loss analysis. Case law can apply Section 267 related party transaction rules in the event a trader plans to avoid a wash sale loss between his entity and individual accounts. If the related party transaction “is purely coincidental and is not prearranged” Section 267 law does not apply. If Section 267 applies it can lead to wash sale loss deferral or losing the wash sale loss permanently. Where can I learn more about wash sales? Read the GreenTraderTax blog “How will you handle wash sale losses on securities this tax season?” and watch the related Webinar recording. I prepared these FAQs for an online broker catering to active securities traders. This entry was posted in Accounting, Cost-Basis Reporting and tagged accounting, cost-basis, wash sales on February 19, 2015 by Robert Green. IRS regulations for wash-sale losses require taxpayers to calculate wash sales based on “substantially identical” positions. That’s different from the rule for brokers that require “identical” positions. This can be a challenge for active traders who trade stocks and options, or just options but with constant changes in exercise dates — these are substantially identical positions. Many brokers report “disallowed wash sales for the year” on 1099-Bs rather than “actual wash sales” at year-end. This causes confusion and anxiety for many taxpayers. The “disallowed wash sales for the year” number may count the same wash sale over and over throughout the year. What counts more is what wash sales are deferred at year-end, and what ones were permanently lost to IRA accounts throughout the year. Many traders and tax preparers who are not well versed in the rules may leap to import 1099-Bs into tax software, but they will probably not comply with the rules for taxpayers. Consider a “Do Not Trade List” to avoid permanent wash-sale losses between taxable and IRA accounts. For example, a trader could trade tech stocks in his individual taxable accounts and energy stocks in his IRA accounts. Otherwise, he can never report a wash-sale loss with an IRA, as there is no way to record the loss in the IRA — it’s a permanent wash sale loss. Taxpayers can “break the chain” on wash-sale losses at year-end in taxable accounts to avoid deferral. If a trader sells Apple equity on Dec. 20, 2019, at a loss, he shouldn’t repurchase Apple equity or Apple equity options until Jan. 21, 2020, avoiding the 30-day window for triggering a wash-sale loss and breaking the chain. Wash-sale loss adjustments during the year in taxable accounts can be absorbed if traders sell/buy those open positions before year-end and don’t buy/sell them back in 30 days. It means there won’t be a wash-sale loss deferral at year-end. Don’t trade securities. Trade Section 1256 contracts and other financial instruments that are not considered securities for tax purposes, like ETN prepaid forward contracts, cryptocurrencies, precious metals, and swap contracts. Only securities are subject to wash sale loss adjustments. This entry was posted in Uncategorized and tagged accounting, cost-basis, wash sales on February 11, 2015 by Robert Green.